Update, 10:30 a.m., The signals issue between Allen and Sierra Madre Villa Station has been resolved and bus shuttles have been cancelled. On behalf of Metro, we’d like to thank all affected customers for their patience and understanding this morning. Also, as a reminder, Gold Line trains are running every 20 minutes and sharing one track at South Pasadena and Fillmore Station until 2:30 p.m. due to planned maintenance. Customers who were delayed and need verification for work or school can call Customer Relations at 213.922.6235. For more transit news and service updates, please check back here on the Source or on Twitter at @metrolosangeles or @metrolaalerts. Update, 8:45 a.m.: Gold Line service between Sierra Madre Villa and Allen remains suspended as crews make necessary repairs to signals near Sierra Made Villa Station. Trains are traveling to Allen Station and returning towards East LA until further notice. Customers wishing to travel between Sierra Madre Villa and Allen may board free Metro bus shuttles running approximately every 10 to 15 minutes. Pasadena Transit is also accepting Metro passes for customers between Sierra Madre Villa and Allen. For travel to Downtown LA from Sierra Madre Villa, consider Line 487. The Metro Gold Line is currently experiencing a signaling system issue near Sierra Madre Villa Station. As a result, train service is suspended between Allen and Sierra Madre Villa. This means all trains will travel as far as Allen and turn back towards East LA. Metro is providing bus shuttle service to transport customers between Allen and Sierra Madre. For alternate service, we encourage customers to use Line 487 for travel between Sierra Madre Villa and Downtown LA. Other routes can be found here. We will continue to provide Gold Line updates as they become available. For up-to-the-minute service alerts, follow @metrolosangeles or @metrolaalerts. Funny how this info is never displayed on the variable message machine at the affected station, much less at others along the very same system. I have a very good app on my cell (Moovit) that notifies me of problems on other trains that I am not interested in (like the Blue line); it would have been nice to know about the Gold line delay (signal problem) at the Sierra Madre station this morning. 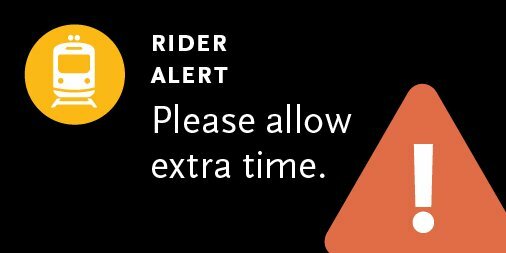 Alerts were sent out on Twitter @metroLAalerts and also posted on metro.net If there were any issues with announcements or displays at stations, please email CustomerRelations@metro.net so staff can follow up. Thanks for your feedback!